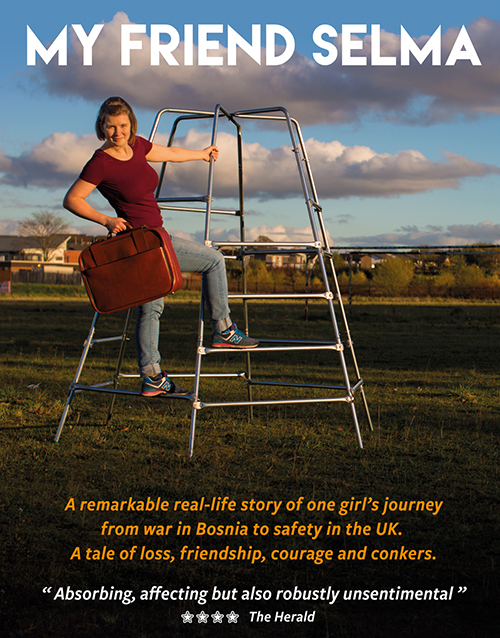 When I was eight years old my dad set up a charity to help people fleeing danger in Bosnia. He brought fifty refugees over here on big coaches. We moved into an old boarding school with them to help them settle in. We lived there for four months. It was brilliant – there was a playground in my front garden, we had lots of visitors, people were always feeding me and I learnt to ride a bike. But the best thing about living there was meeting my friend Selma. The tale of an incredible journey, a world turned upside down, loss, friendship, courage and conkers. My Friend Selma will be visiting schools across Scotland in the Autumn as part of Theatre in Schools Scotland. We will also be doing 3 public performances at The Tron Theatre, Glasgow. This project is delivered with support from Creative Scotland. My Friend Selma will be performing in schools across Scotland throughout Autumn 2018 as part of the Theatre in Schools Scotland initiative. My Friend Selma tours with a small exhibition about the real life story that inspired the show. You can visit an online version of this museum. Tickets are £11 (£8.50). You can buy tickets here.